$139 including a huge kit of supplies to take home! Honestly, I LOVE symbols. Symbols are personal and yet they connect you to ritual and story and history. Spirals, for example, show up in my life all the time. If you poked through a box of my jewelry, saved since high school, you'd find so many spirals on rings, on earrings, pins, necklaces. If you looked through my art journals or the art on my walls at home you'd see spirals there, too. To me, the spiral represents not only a journey, but finding my way, going deeper, and a life path. In my expressive arts training the spiral showed up multiple times, always through my open, intuitive work. And there it also meant holding space for my students to explore their creativity...without holding too tight...an opening always there to arrive or depart as it suited them. That's why I'm offering this absorbing and fun workshop at Unfold Studio. Symbols and stamps are perfect partners in creativity. 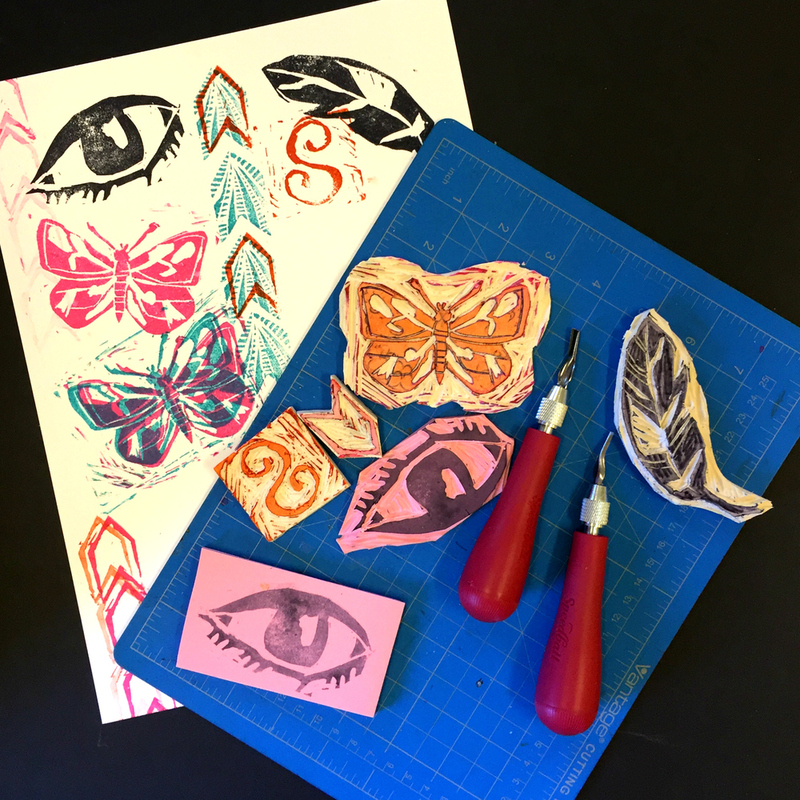 During this workshop we'll explore our personal symbology as well as create a variety of wonderful and original stamps for use in your work. I will give easy-to-follow step by step instructions to create a box full of your own personal stampable images and patterns that you can keep and use at home or in the studio. There are so many possibilities for making your OWN images with stamps. Found objects, carved rubber, and simple stickyback foamie sheets are all easy to use. The key is to have the time, space and tools, and a little instruction. SIGN UP NOW TO CREATE YOUR OWN STASH OF YOUR PERSONAL AND POWERFUL SYMBOLS! There will be an extra supplies charge as I will be supplying the specific materials for you to use during the workshop. See below for more information. which includes a $40 non-refundable supplies fee. Supplies include: worksheet packet, one pair no-cut gloves, a 5 blade carving set, a large sheet of Speedy Carve, and more. All materials are yours to keep and take home for more stamp carving fun! CANCELLATION POLICY: Full refund until one month prior (April 18th). After that time, we are happy to refund 75% of your registration fee (MINUS the materials fee) if we are able to fill your spot. WHO: Because of the use of sharp tools, adults only for this workshop.